FAQ: How to send mail on behalf of another user? 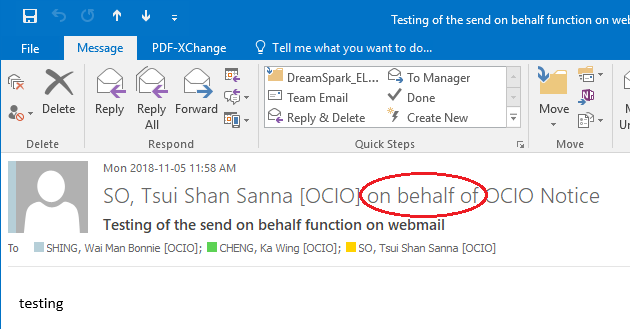 Microsoft Outlook allows one user to send mail on behalf of another user. 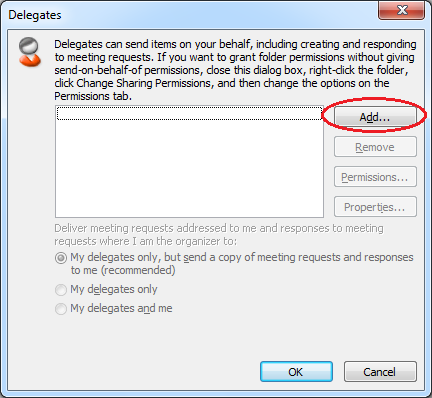 You can set up delegate permissions so that someone can send messages on your behalf. 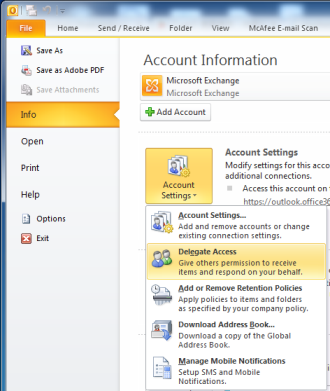 The current version of Outlook Web App will not let you delegate permissions for other colleagues to view your Mailbox. You can grant permissions for mailbox or calendar. For additional permissions to the calendar and Mailbox are administered from the full Outlook client and cannot be controlled through OWA. From the ribbon menu, click "File". 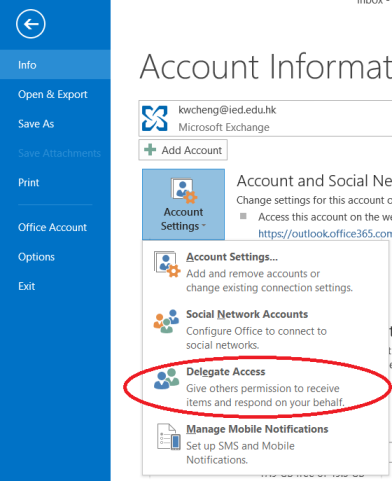 Click "Account Settings" -> "Delegate Access"
Select a user from the global address list, click "Add", and click "OK". Choose "Editor" from the list of Permissions for the Inbox. 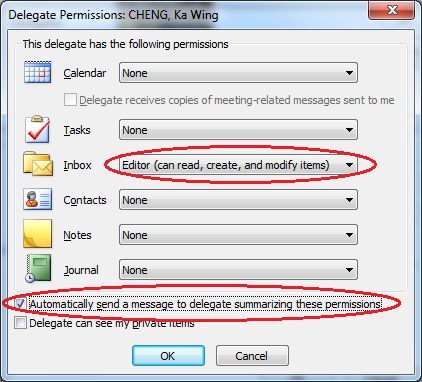 You are recommended to tick the option "Automatically send a message to delegate summarizing these permissions" as well. Then click "OK". 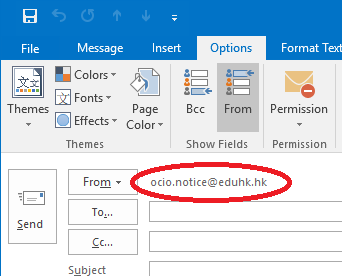 Log in to your mailbox using Outlook Web App. Click new New mail above the folder list. A new message form will appear in the reading pane. Click the more options menu , and then click Show From. Right click the email address and choose Remove. Type the account name of the owner. Then fill in other fields and the message body as needed, and click Send. From the ribbon menu, choose "Options", in the "Show Fields" session, click the "From" button. Then the "From" selection button will be shown. Click on it and select "Other Email Address...". 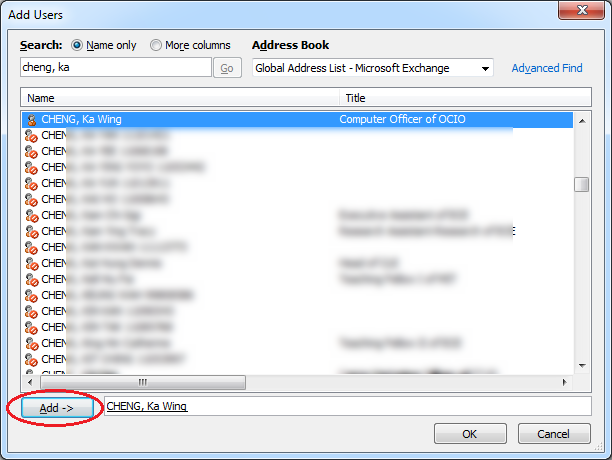 Select the owner from the global address list or type the account name. Then fill in other fields and the message body as needed, and click Send. 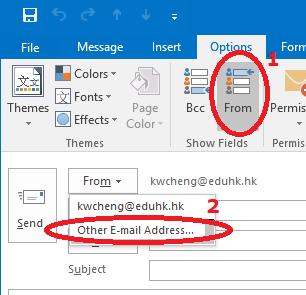 When the message is received, the From Field looks similar to "Delegate on Behalf of Owner" where Delegate is equal to the name of the user with Delegate permissions and Owner is equal to the name of the mailbox owner.